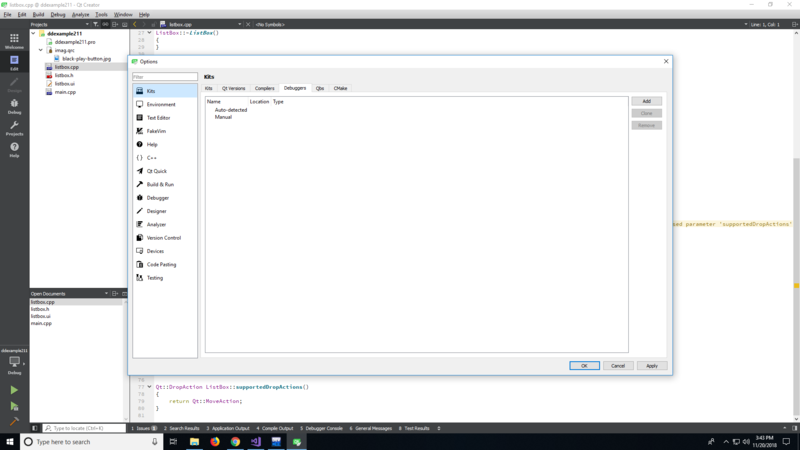 In QT engine how to "Unable to create a debugging engine"? I am using QT 5.10.1. When i am trying to debug my code. At, that time i am getting this one error "Unable to create a debugging engine. Please select a Debugger Setting from the Run page of the project mode". What is your kits configuration ? As you see you do not have debugger . Can you follow this http://doc.qt.io/qtcreator/creator-debuggers.html? As you see in link there is a path field. U can refer that path. @Ratzz first i need to download this file or not "For CDB (Windows only), specify the path to the Windows Console Debugger executable." Beacuse in debugder colun nothing will be there. If Qt Creator does not show auto detected debugger then most likely u don't have debugger. U can manually add debugger if u have installed. Else u need to install windows debugger. You want the "Developer's tools" (where cdb is) and probably the SDK (for headers and libraries). There's a separate package, which I believe is called "Window's developer tools", that is not included in Visual Studio. The console debugger (cdb, which you want) is packaged there. @kshegunov i have already downloaded this one tools "SDT"
Okay, that's good. It's been some time since I've set up a windows environment, but bear with me. As far as I can remember when you start that installer you have to choose components. When you do, make sure you've selected the console debugger to be installed. 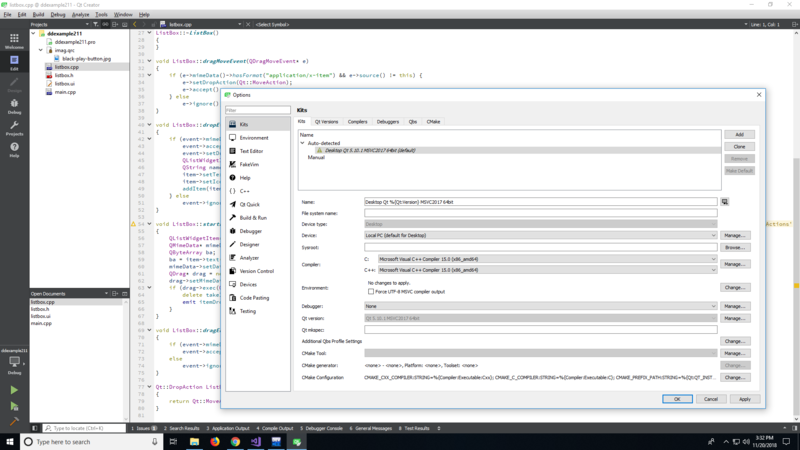 After you've installed it someplace, then you can just point Creator to it - that is create a debugger entry on the respective page in the creator configuration and then select it from the dropdown list in the kit configuration page. Did you run the setup you downloaded? 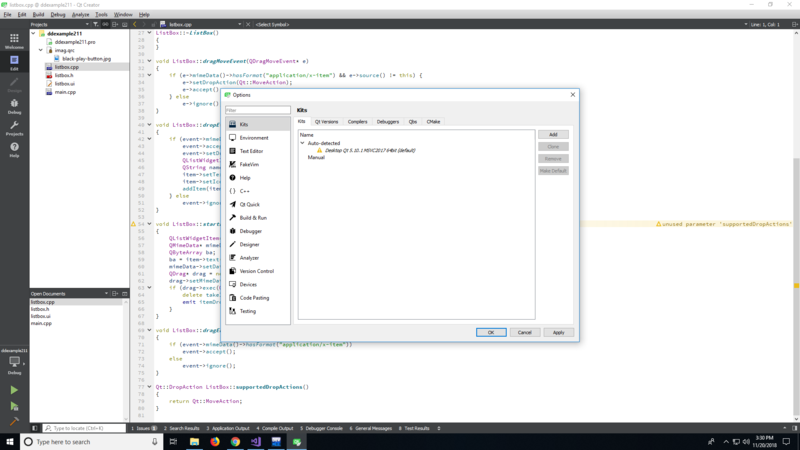 Did you check in Qt Creator if debugger is detected? After you've made sure you have installed the console debugger, add an entry in the debuggers in Creator and select the path to it. Then you can add it to the kit.